For other uses, see Three Little Pigs (disambiguation). The Three Little Pigs is a fable about three pigs who build three houses of different materials. A Big Bad Wolf blows down the first two pigs' houses, made of straw and sticks respectively, but is unable to destroy the third pig's house, made of bricks. Printed versions date back to the 1840s, but the story itself is thought to be much older. The phrases used in the story, and the various morals drawn from it, have become embedded in Western culture. Many versions of The Three Little Pigs have been recreated or have been modified over the years, sometimes making the wolf a kind character. It is a type B124 folktale in the Aarne–Thompson classification system. The wolf blows down the straw house in a 1904 adaptation of the story. Illustration by Leonard Leslie Brooke. The Three Little Pigs was included in The Nursery Rhymes of England (London and New York, c.1886), by James Halliwell-Phillipps. The story in its arguably best-known form appeared in English Fairy Tales by Joseph Jacobs, first published on June 19, 1890 and crediting Halliwell as his source. "No, no, by the hair on my chinny chin chin." The third little pig builds a house of bricks. The wolf fails to blow down the house. He then attempts to trick the pig out of the house by asking to meet him at various places, but he is outwitted each time. Finally, the wolf resolves to come down the chimney, whereupon the pig catches the wolf in a cauldron of boiling water, slams the lid on, then cooks and eats him. 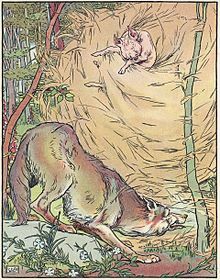 In some versions, the first and second little pigs are not eaten by the wolf after he demolishes their homes, but instead run to their brother's house, and after the wolf goes down the chimney he either dies like in the original, or runs away and never returns to eat the three little pigs, who all survive in either case. The story uses the literary rule of three, expressed in this case as a "contrasting three", as the third pig's brick house turns out to be the only one which is adequate to withstand the wolf. Variations of the tale appeared in Uncle Remus: His Songs and Sayings in 1881. The story also made an appearance in Nights with Uncle Remus in 1883, both by Joel Chandler Harris, in which the pigs were replaced by Brer Rabbit. Andrew Lang included it in The Green Fairy Book, published in 1892, but did not cite his source. In contrast to Jacobs's version, which left the pigs nameless, Lang's retelling cast the pigs as Browny, Whitey, and Blacky. It also set itself apart by exploring each pig's character and detailing interaction between them. The antagonist of this version is a fox, not a wolf. The pigs' houses are made either of mud, cabbage, or brick. Blacky, the third pig, rescues his brother and sister from the fox's den after the fox has been defeated. The most well-known version of the story is the award-winning 1933 Silly Symphony cartoon, which was produced by Walt Disney. The production cast the title characters as Fifer Pig, Fiddler Pig, and Practical Pig. The first two are depicted as both frivolous and arrogant. The story has been somewhat softened. The first two pigs still get their houses blown down, but escape from the wolf. Also, the wolf is not boiled to death but simply burns his behind and runs away. Three sequels soon followed in 1934, 1936 and 1939 respectively as a result of the short's popularity. Fifer Pig, Fiddler Pig, Practical Pig and the Big Bad Wolf appeared in the 2001 series Disney's House of Mouse in many episodes, and again in Mickey's Magical Christmas: Snowed in at the House of Mouse. The three pigs can be seen in Walt Disney Parks and Resorts as greetable characters. In 1942, there was a Merrie Melodies version, Pigs in a Polka, which was a serious musical treatment, plus the usual Friz Freleng visual humor. It parodies both the Disney version, and Fantasia itself. Other versions of the tale were also made. One was an MGM Tex Avery cartoon named Blitz Wolf, a 1942 wartime version with the Wolf as a Nazi. Another animated spoof was a 1952 Warner Brothers cartoon called The Turn-Tale Wolf, directed by Robert McKimson. This cartoon tells the story from the wolf's point of view and makes the pigs out to be the villains. Another Warner Brothers spoof was Friz Freleng's The Three Little Bops (1957), which depicts the three little pigs as jazz musicians who refuse to let the wolf join their band. In 1953, Tex Avery did a Droopy cartoon, "The Three Little Pups". In it, the wolf is a Southern-accented dog catcher (voiced by Daws Butler) trying to catch Droopy and his brothers, Snoopy and Loopy, to put in the dog pound. Though successfully blowing the first two houses down, he meets his match when he fails to blow down Droopy's house of bricks. The dog catcher makes several failed attempts to destroy the house and catch the pups. His last failed attempt ended with him "going to television" where he is playing a cowboy on the TV show the pups were watching. The 1989 parody The True Story of the 3 Little Pigs! is presented as a first-person narrative by the wolf, who portrays the entire incident as a misunderstanding; he had gone to the pigs to borrow some sugar, had destroyed their houses in a sneezing fit, ate the first two pigs to not waste food (since they'd died in the house collapse anyway), and was caught attacking the third pig's house after the pig had continually insulted him. The 1992 Green Jellö song, Three Little Pigs (and its claymation music video) sets the story in Los Angeles. The wolf drives a Harley Davidson motorcycle, the first little pig is an aspiring guitarist, the second is a cannabis smoking, dumpster diving evangelist and the third holds a Master of Architecture degree from Harvard University. In the end, with all three pigs barricaded in the brick house, the third pig calls 9-1-1. John Rambo is dispatched to the scene, and kills the wolf with a machine gun. The 1993 children's book The Three Little Wolves and the Big Bad Pig inverts the cast and makes a few changes to the plot: the wolves build a brick house, then a concrete house, then a steel house, and finally a house of flowers. The pig is unable to blow the houses down, destroying them by other means, but eventually gives up his wicked ways when he smells the scent of the flower house, and becomes friends with the wolves. In one Shining Time Station episode, Schemer's Alone, Midge Smoot reads a version of this story to Schemer who paid her an IOU instead of real money, despite the fact that he's tricking his friends. The three pigs and the wolf appear in the four Shrek films, and the specials Shrek the Halls and Scared Shrekless. In 2003, the Flemish company Studio 100 created a musical called Three Little Pigs (Dutch: De 3 Biggetjes), which follows the three daughters of the pig with the house of stone with new original songs, introducing a completely new story loosely based on the original story. The musical was specially written for the band K3, who play the three little pigs, Pirky, Parky and Porky (Dutch: Knirri, Knarri and Knorri). In 2014, Peter Lund let the three little pigs live together in a village in the musical Grimm with Little Red Riding Hood and other fairy tale characters. ^ Ashliman, Professor D. L. "Three Little Pigs and other folktales of Aarne-Thompson-Uther type 124". Folklore and Mythology Electronic Texts. University of Pittsburgh. Retrieved 25 July 2010. ^ a b Tatar, Maria (2002). The Annotated Classic Fairy Tales. W. W. Norton & Company. pp. 206–211. ISBN 978-0-393-05163-6. ^ Jacobs, Joseph (1890). English Fairy Tales. Oxford University. p. 69. ^ Booker, Christopher (2005). "The Rule of Three". The Seven Basic Plots: Why We Tell Stories. Continuum International Publishing Group. pp. 230–231. ^ "De 3 Biggetjes* - Studio 100 Cd-Collectie 3/10 - Het Beste Van De 3 Biggetjes !". Discogs. Retrieved 2018-11-21. ^ "bol.com | De 3 Biggetjes, Various | CD (album) | Muziek" (in Dutch). bol.com. Retrieved 2018-11-21. Wikimedia Commons has media related to Three little pigs. MP3 of the song "Who's Afraid of the Big Bad Wolf"